Matilda Adams (1815-1896),Violet Paget’s mother. From a painting by Frank Stone, in Peter Gunn, p. 20. “She was quite cynical, disillusioned and emancipated, but she believed in behaving conventionally on the surface if you wanted to go into society which, however, she didn’t. She left England to escape the English Sunday, and went to live in France. Her two husbands bore her and she gave them their liberty after having had a child by each.” VL quoted in Cooper Willis, p. v-vi. Mr Henry Hippolyte Ferguson Paget: “My grand-father was a teacher in Poland; my father was educated there, in Poland; then he became an engineer. He took part in the construction of the railway between Warsaw and Moscow. He was still horrified by the russian and the prussian persecutions. Together with other Polish people, he emigrated into France in 1849, and even joined the Garde Nationale in Paris…”VL to Berthe Noufflard. Unpublished MSS. 28 July 1934. (My transl. from the original French: “Mon grand père avait été professeur en Pologne –mon père y avait été élevé –et puis y avait travaillé comme ingénieur—Il avait participé à la construction du chemin-de-fer Varsovie-Moscou. Il en avait conservé l’horreur des persécutions russes et prussiennes –Il avait émigré en France avec des Polonais en 1849 –il avait même fait partie de la Garde Nationale à Paris…” VL à Berthe Noufflard. MSS Inédit. 28 juillet 1934. “He led a life apart from his family. It used to be said that he always had his meals at the railway station.” Cooper Willis, p. ix. 1845: birth of Violet’s half-brother, the poet Eugene Lee-Hamilton. 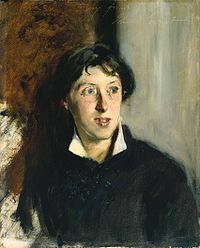 About her education, VL wrote: “I recognize now that my family is, on one side, acutely [word illegible] & hysterical, & that my earlier years were obdurately calculated, by an alternation of indiscipline & terrorism, by exertion, over work & a [word illegible] solitude, to develop these characteristics.” VL, Unpublished letter to Carlo Placci, 9 Aug. 1894, Biblioteca Maruccelliana, Carteggio Placci. Winter 1866-67: VL meets John Singer Sargent in Nice. 1868-1870: VL and family spend the winters in Rome (with John Singer Sargent and family) and the summers in Paris. 1868: writes the Biographie d’une pièce de monnaie. Violet as a child. Photographs taken from Peter Gunn, p. 21. 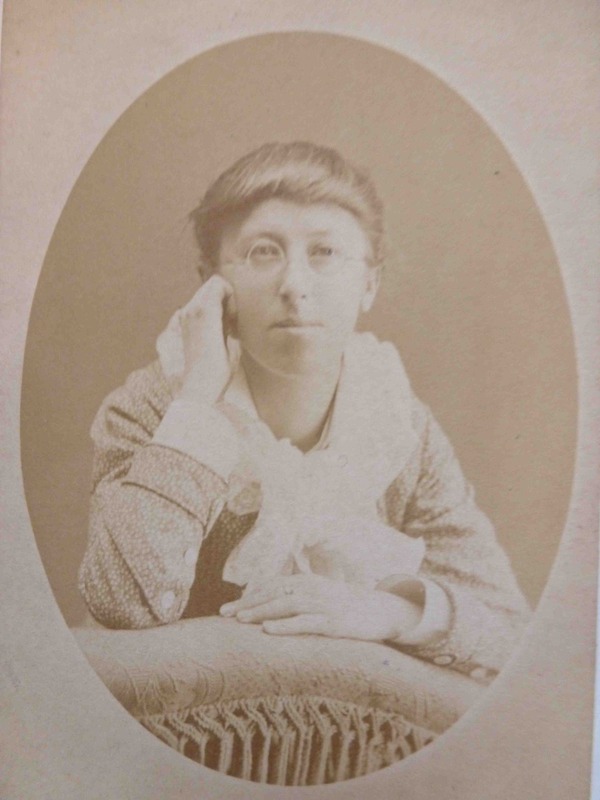 1870: At 14, VL begins collecting material for her Studies of the Eighteenth Century in Italy. Visiting the gardens of the Villa Doria, she “longed to conjure up the shades of its former society.” Cooper Willis, preface, op. cit., p. iv. Tries to have Capo Serpente published. 1873: the family settle permanently in Italy. 1873: Eugene’s first paralytic symptoms. He was a prostrate invalid through the following 20 years. 2 October 1874: “On the Fourteenth of this month I shall be eighteen […] I know that writing must be my profession as well as my pleasure. […] I am quite in earnest: literature must be my profession, and the sooner I begin, the better–so at least it seems to me.” Letter to Mrs Jenkins, in Letters, op. cit., p. 40-41. 6 April 1875: “The name I have chosen as containing part of my brother’s and my father’s and my own initials is H.P. 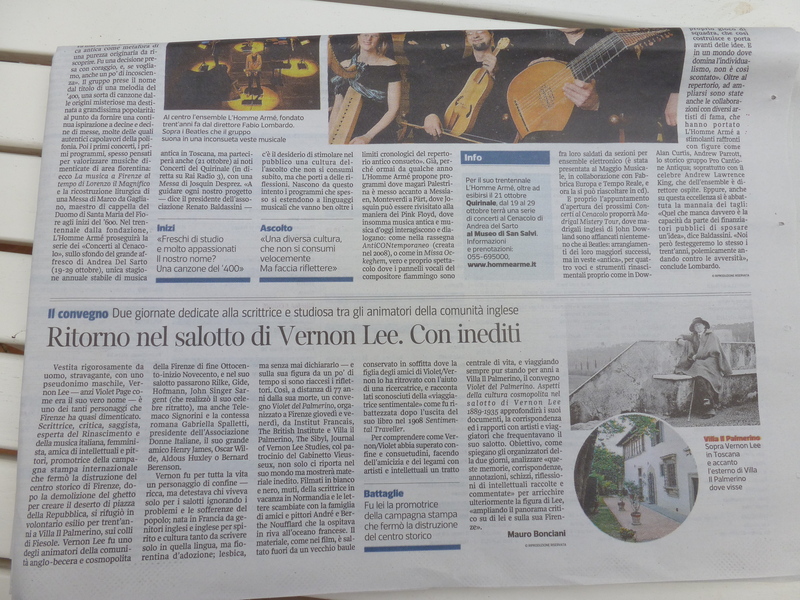 Vernon-Lee. It has the advantage of leaving it undecided whether the writer be a man or a woman.” Letter to Mrs Jenkins, in Letters, op. cit., p. 49. 1879? “some time before 1880” (Gunn 76) meets Mary Robinson. Photograph of Vernon Lee by Mary Robinson. 1883 or 1884? Death of Annie Meyer. VL shattered. 1880-1884: publishes 6 books and 20 articles, reviews, short stories. 1880: publication (anonymously) of Tuscan Fairy Tales, Taken from the Mouth of the People. 1880: Publication of Studies of the Eighteenth Century in Italy. Her masterpiece. Immediate success. 1881: Belcaro, being Essays on Sundry Aesthetical Considerations. Dedicated to Mary Robinson. 1883: The Prince of the Hundred Soups: A Puppet-Show in Narrative. 1884: The Countess of Albany. June 1881: VL’s portrait done by her great friend John Singer Sargent: “[John] came the day before yesterday to do my likeness; about three hours’ sitting […]; I enjoyed it very much; John talking the whole time & strumming the piano between whiles. I like him. 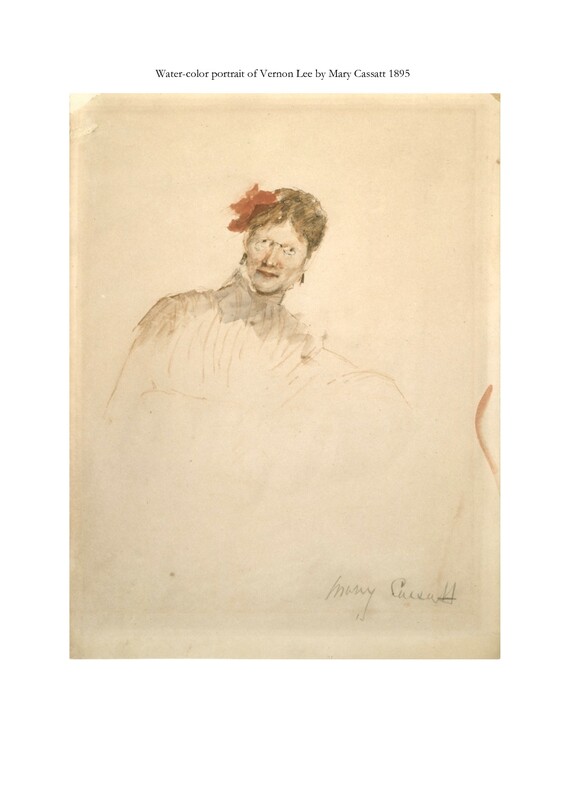 The sketch is, by everyone’s admission, extraordinarily clever & characteristic; it is of course mere dabs & blurs & considerably caricatured, but certainly more like me than I expected anything could–rather fierce & cantankerous.” Letter to her “dearest Mamma”, 25 June 1881, in Cooper Willis (ed.) Letters, op. cit., p. 65. 26 June 1881: “… talking of literary fame, the only two creatures who seemed to have heard of me as a writer were Wm. 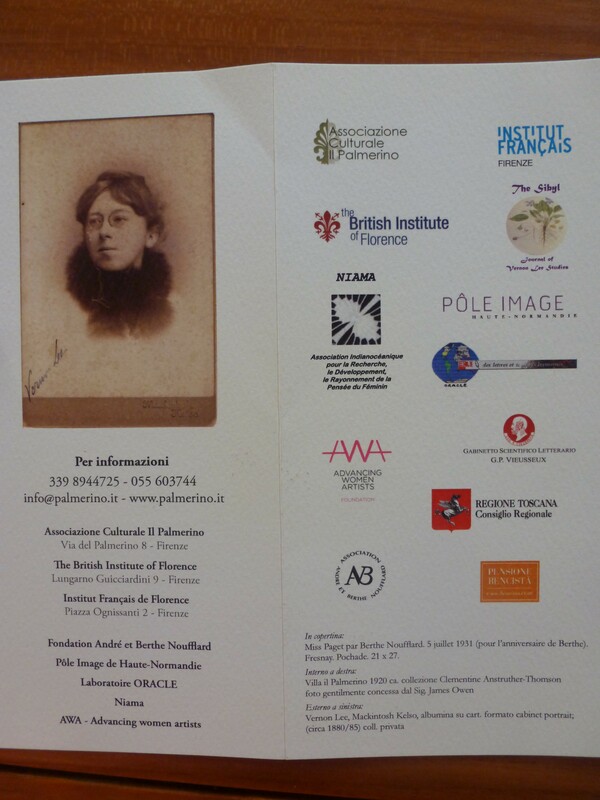 Rossetti & Oscar Wilde!” (Letter to “my dearest Mamma”, in Letters, op. cit., p. 66). 18 July 1881: meets Walter Pater: “He is a heavy, shy, dull-looking brown moustachioed creature over forty, much like Velasquez’ Philip IV, lymphatic, dull, humourless. I sat next him at supper & then he sat by me all the evening. Of all the people I have met in England he is the one who has been most civil to me. […] He is heavy but, to my surprise quite unaffected.” Letter to “my dearest Mamma”, in Letters, op. cit., p. 78-9. 1882: the Pagets settle in Florence. 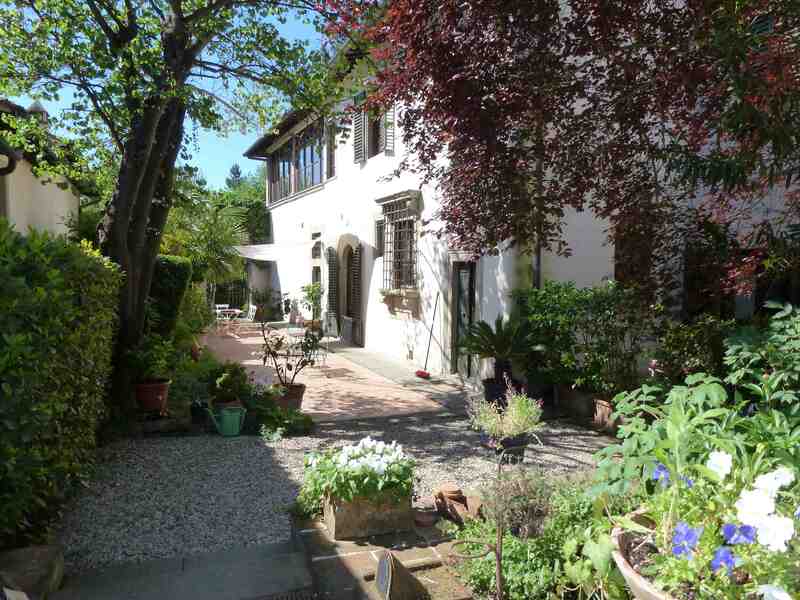 1882: the family move into 5, via Garibaldi, Florence. 1884: Miss Brown, her roman à clé: publication and scandal. 28 August 1886: VL famous at last: “I hear that Oke [of Okehurst] is flaring about on all the bookstalls of the kingdom. But whether I shall be any richer for that I don’t know.” Letter to “my dearest Mamma”, in Letters, op. cit., p. 236. 8 September 1886: VL back in Italy: “for all my interest in England, this is my country.” Letter to “my dearest Mamma”, in Letters, op. cit., 238. 1886: Baldwin: being Dialogues on Views and Aspirations. 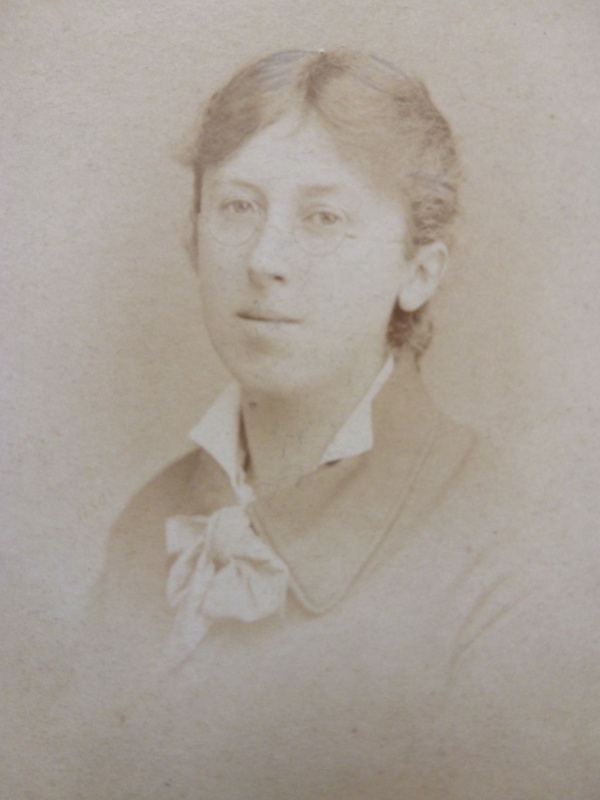 24 July 1887: meets Clementina (Kit) Anstruther-Thomson: “My hostess has gone to the station to fetch another woman coming here for Sunday, a Miss Anstruther-Thomson, a semi-painter, semi-sculptor, handsome creature, who is, or was, a great friend of Mrs Callander’s, & with whom I am expected to make great friends.” Letter to “Mamma”, dated from Effingham, Surrey, in Letters, op. cit., p. 260. 25 July 1887: “Miss Anstruther-Thomson turns out very handsome, a sort of Venus of Milo—Margaret-Cantagalli creature, clever & curiously interesting. […] she is a picturesque personality, paints very well, dresses crane & rather fast, drives tandem & plays polo…” Letter to “Mamma”, in Letters, op. cit., p. 261. From now on, VL will be attracted to Scotland, especially to St Andrews (“The handsome Miss A T lives 10 miles beyond”). Letters, op. cit., p. 261. 25 August 1887: VL’s mysterious breakdown at Kit’s house: “my plans are shattered, scattered for the moment by a rather astonishing occurrence, owing to which I may be wanted to stay on in England for another few days. […] I am sorry to have to be so mysterious […] Please tell no one, except Eugene […] of any upsetting of my plans. /The business which thus sets everything per aria, although it has nothing ostensibly to do with me—other folks’ business altogether–touches me in a way, I mean causes me some faint trouble—in fact has given me rather a shock./ I cannot say how grateful I am to circumstances that this complication should find me in this house rather than in any other.” Letter to “Mamma”, in Letters, op. cit., p. 271. The mystery is explained a few days later (30 August 1887): “Last week I received half a sheet of notepaper from Mary [Robinson] telling me she has engaged herself to marry James Darmsteter […]” Letter to “Mamma”, in Letters, op. cit., p. 272. 1887: Juvenilia. Dedicated to Carlo Placci. 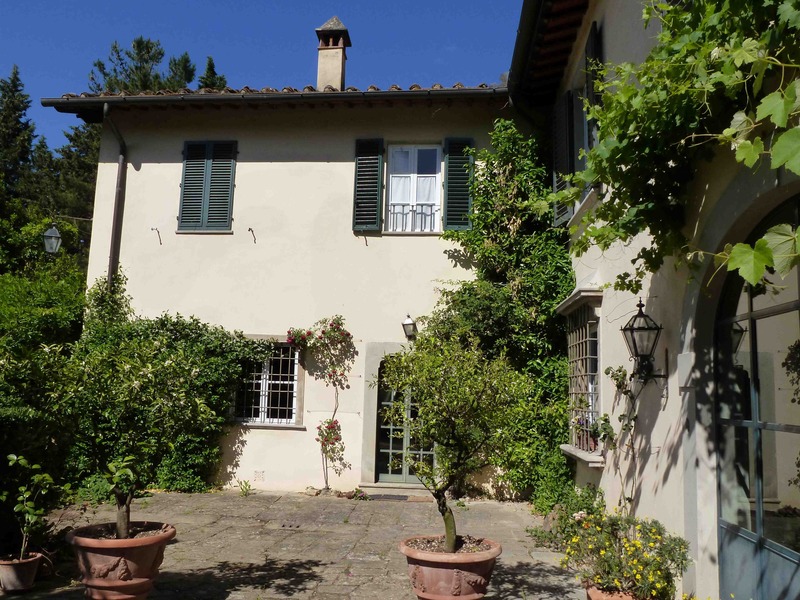 1888: the Pagets move to Villa Il Palmerino, n° 8-12 via dell Palmerino, Maiano. Personal photographs. Courtesy of the current owners of Il Palmerino. November 1888-late January 1889: VL travels to Tangier with Kit (via Spain, Gibraltar, then back via Malaga, Granada, Cadiz, Naples, Pompei); the two friends depressed and sick. November 1891: VL starts lecturing (“It might be a mode of influence & money making.”) Post card dated 9 Nov. 1891, to “Mamma”, in Letters, op. cit., p. 342. 4 July 1893: Meets G. B. Shaw : “ a young socialist, who despite (I think) his socialism, is one of the most really brilliant writers & thinkers we have, paradoxical (sic) wrongheaded & perhaps a little caddish, but original.” Letter to “Mamma”, in Letters, op. cit., p. 349. 20 August 1893: VL lectures in Cambridge: “the audience […] were not at all university people, but a sort of vast intellectual pilgrimage called University Extension meeting, which come together here & at Oxford every summer for a sort of fortnight’s debauch of lectures on every imaginable subject.” Letter to “Mamma”, in Letters, op. cit., p. 359. 31 August 1893: “I don’t think it is my obscurity which prevents my being popular, but my habit & determination to write only to please myself, irrespective of readers […] At thirty-seven I have no public, but […] I think it better to restrict my expenditure than to increase my income. […] I feel every day more & more that I don’t know enough of life to write a novel I should care to read. Life is too serious to be misrepresented as in Miss Brown. … At sixty I will write a novel. So I am bound to be unpopular, & you must just put up with it. And so must Mamma.” Letter to Eugene, in Letters, op. cit., pp. 364-65. 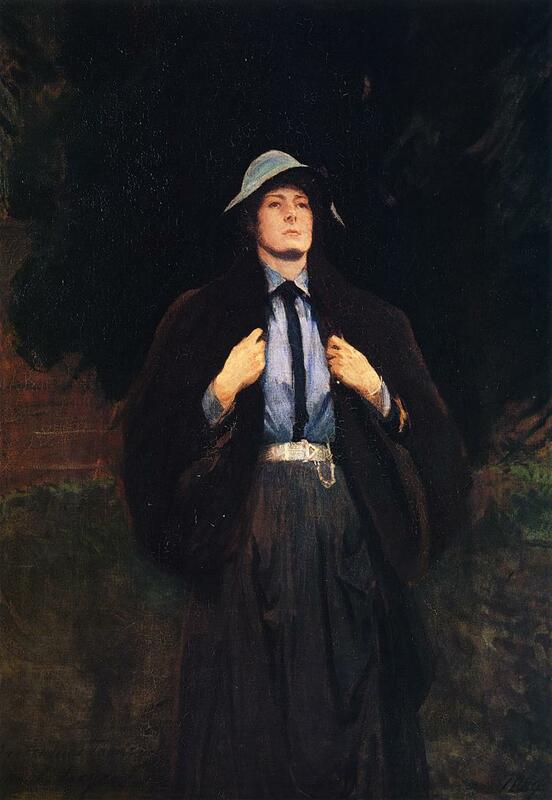 November 1894: death of her father. 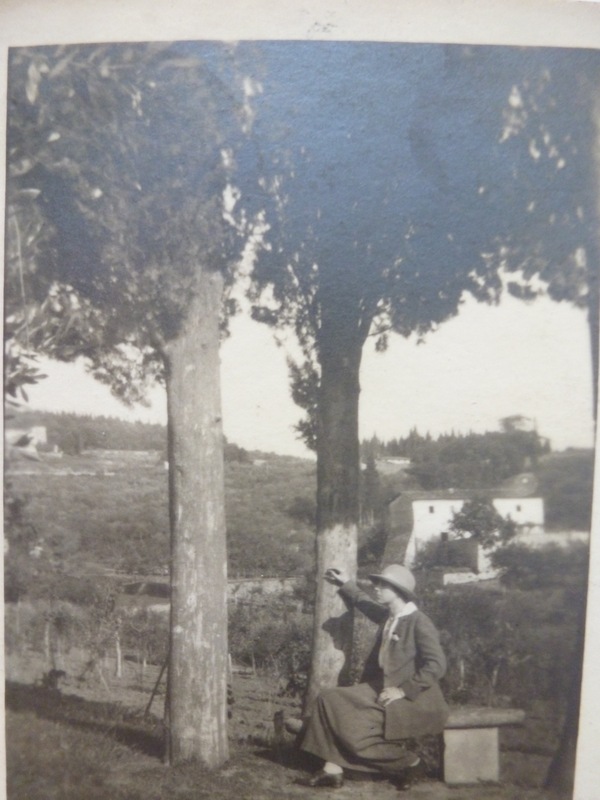 She writes to Carlo Placci: “I used to like to hear him talk about how animals lived & plants grew & clouds & water moved: he seemed to know it all intimately, with the very simple, austere character of a real sportsman & a naturalist. I am so glad he had that bit of romance & adventure too, of the Polish & Hungarian revolutions…” She is disappointed by the lack of outward sign of grief in her mother’s attitude: “she let Eugene & me take her drives, read to E. regularly & yesterday began to read Taine’s Ancien Régime quite hard to herself. ‘It is so touching & so splendid!’ What a beautiful & blessed thing is this old fashioned English tenue!” Unpublished letter to Carlo Placci , Biblioteca Marucelliana, Carteggio Placci. She secretly cremates her father, complying with his wishes; her mother will remain convinced that he is buried in the family’s grave. 1894: Althea: a Second Book of Dialogues on Aspirations and Duties. 1895: Renaissance Fancies and Studies. 1896: death of her mother. VL’s parents’ tomb. Personal photograph. 1897: Bernard Berenson’s accusation against VL and Kit’s Beauty and Ugliness. The quarrel lasted for 25 years, but was settled by Mary Berenson. 1898: Eugene marries Annie Holdsworth in Hampshire. VL is present, but “strongly advise[s] against his having children.” Peter Gunn, Vernon Lee-Violet Paget, 1856-1935, London: Oxford University Press, 1964, p. 163. 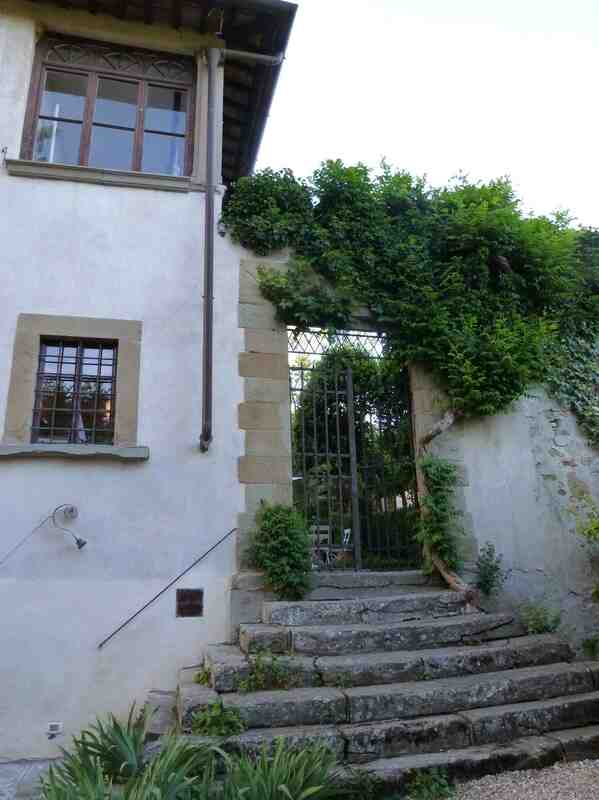 1899: Genius Loci : Notes on Places. Aug. 1902: Annie pregnant. VL taken aback by “this awful catastrophe”. 2 October 1904: death of little Persis, who strikingly looked like her aunt. VL and Eugene estranged: “I am grateful for your kind words. But had you given her a single smile or penny toy while she was alive, it would have been more to the purpose…” Eugene Lee-Hamilton, letter quoted in P. Gunn, op. cit., p. 164. 1903: VL’s play Ariadne in Mantua published. 1904: Hortus Vitae: Essays on the Gardening of Life. 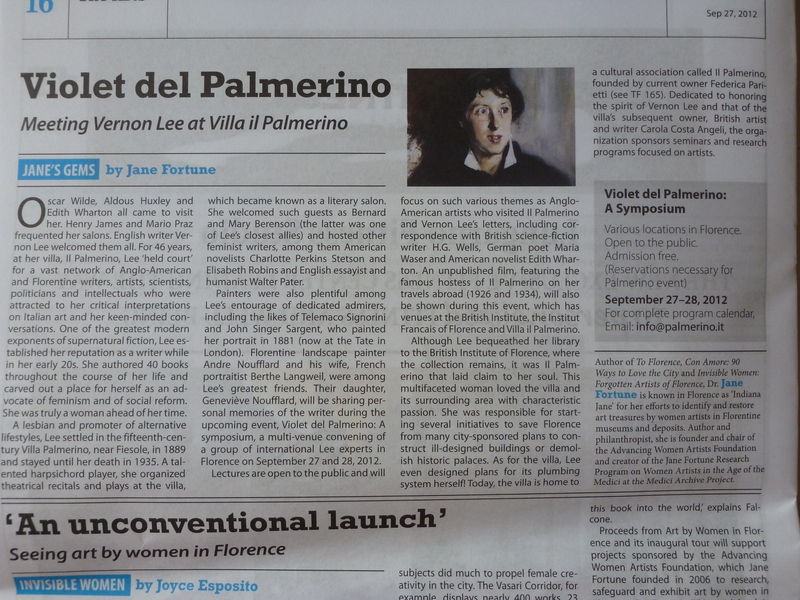 1906: VL buys the Villa Il Palmerino. 1906: Sister Benvenuta and the Christ Child. 1906: The Spirit of Rome: Leaves from a Diary. September 1907 : death of Eugene. Personal photograph. Cimetiero Agli Allori, Florence. 1908: Gospels of Anarchy. Dedicated to H. G. Wells. 1908: The Sentimental Traveller: Notes on Places. 1909: Laurus Nobilis: Chapters on Art and Life. 1912: Vital Lies: Studies of Some Varieties of Recent Obscurantism. 1912: Beauty and Ugliness. With Clementina Anstruther Thomson. 1913: The Beautiful: An Introduction to Psychological Aesthetics. 1914: Louis Norbert, a Two-Fold Romance. 1914: The Tower of Mirrors: and Other Essays on the Spirit of Places. 1915: writes The Ballet of Nations, a Present-Day Morality. Dedicated to Romain Rolland. Published in 1920 as Satan the Waster: A Philosophical War Trilogy. 1914-1920: a pacifist through the war, VL remains in England. 1923: The Handling of Words: and Other Studies in Literary Psychology. 20 September 1924 : VL awarded Honorary Degree of Doctor of Letters by the University of Durham. 1925: Proteus, or the Future of Intelligence. 1927: For Maurice: Five Unlikely Stories. Dedicated to Maurice Baring. 1932 : Music and Its Lovers published. Summer 1934: last visit to England. 13 February 1935: death of V. Lee. Cremated and buried in the Agli Allori Cemetery. VL’s Plaque at Villa Il Palmerino. Personal photograph. Have been staying at I’ll palmerino for almost 2 weeks now and have become totally entranced by the history of the house, Vernon Lee and her life here and all the amazing people still associated with this residence. This was my time alone to explore the Renaissance treasures in florence and there could be no better location from which to base these studies. I intend to return -as most do- for another period of “study”.